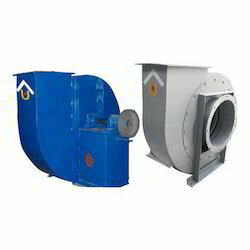 Offering you a complete choice of products which include hot air blower, fan impellers, dust scrubbers, pp scrubber, pp- frp blowers and exhaust fan. 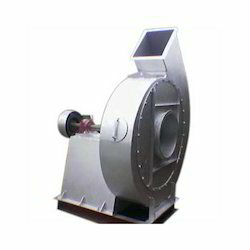 The range of Hot Air Blowers is fabricated using high grade raw material and components. These products are widely used for silicone and platinum coatings in different industries. Robust construction of these blowers and their availability in various technical specifications have made these blowers a preferred choice of the customers. Compactly built and easy to integrate any industrial processes, these Hot Air Blowers are procured from some of the most dependable vendors in the domain. 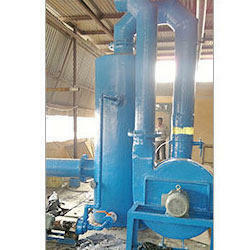 We are one of the most trusted Suppliers and Distributors of the Hot Air Blowers from Mumbai (Maharashtra). Our range of Hot Air Blowers consists of AH 302 Master Flow Hot Air Blower, AH 502 Master Flow Hot Air Blower and AH 752 Master Flow Hot Air Blower. 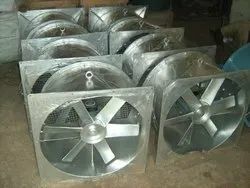 We are the leading manufacturer and supplier of Fan Impellers. The quality of products & services has made us totally distinct from others operating in this sphere. The constant encouragement & support of our domestic clients encourage us to successfully penetrate the international market. Our products match with all international standards. Being the heart of the Blower, Impeller is suitably designed for required combination of air quantity and air pressure for various applications. We manufacture Impellers in Mild Steel/Stainless steel / F.R.P./Aluminium with F.R.P./ Rubber lining Impellers as per requirements. Impellers are duly machined after careful fabrication and Statically and Dynamically balanced for minimum sound level and vibration. Air Pressure: Up to 1100mm of w.g. We provide Powerful fans in a wide range of models. This Centrifugal FRP fans blow air perpendicular to the intake, providing greater air pressure per volume for optimum performance with minimal interruption. Our centrifugal fans are designed for long, trouble-free service, ensuring incredible value, and they are available in a wide range of models including an in-line model, to meet your air handling requirements needs. Blow-Tech pretests every fan before shipping, and we evaluate each unit against AMCA standards. We also dynamically balance every fan prior to delivery guarantee smoother, longer runtime. With Blow-Tech, you get a fan that does the job right—and does it for the long haul. 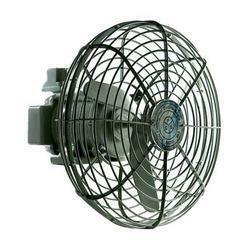 We have marked a distinct position in the market by providing Cabinet Fan. 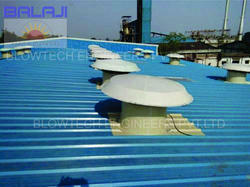 This fan is designed and engineered using supreme class components in compliance with set industry norms. We assure our valuable clients that offered machine is checked on several quality parameters. 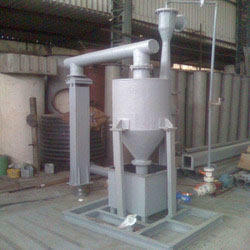 This machine is offered at very nominal to the clients. We are also engaged in providing Centralized Industrial Dust Collection Systems to our clients at the market leading price. We have the expertise to provide project sizes from 650 CFM to 5 Million CFM. The raw material used is acquired from reputed vendors of the industry. Our engineers use the latest technology to give you the best products every time and give you maximum satisfaction. Precision Engineered Centralized Industrial Dust Collection SystemsWe are offering precision engineered industrial Centralized Industrial Dust Collection systems. Our range is ideal for collecting wood dust, chips and shavings at the point of origin. It is designed based on the principle of central vacuum systems, our dust collection systems has fixed motor creates suction, which is distributed through the space via a network of rigid ducting and flexible hoses to the point of use. We are a prominent Manufacturer and Supplier of High Pressure Fan from Gujarat. 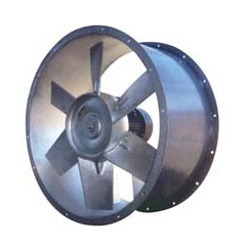 Our range of High Pressure Fan is widely demanded in various industries owing to its qualitative features. 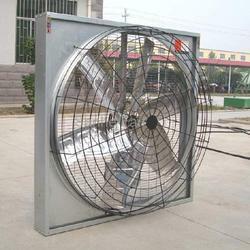 Moreover, the clients can avail High Pressure Fan in varied specifications. 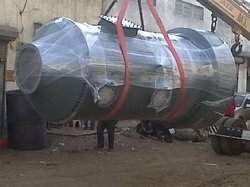 The centrifugal fans fabricated by us are accessible in small as well as in large size. These are used to impart the energy into air stream and suitable for the exhaust of clear air. The centrifugal fans manufactured by us are available in low, medium and high-pressure models with various volume flows for the different necessities. These fans are used for handling gas volume 0.3 m3/sec to 120 m3/sec and pressure ranging from 25mmwc to 2500mmwc in single stage. 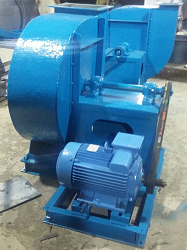 We fabricate centrifugal fans along with different blade configuration like radial tipped, forward curved, aerofoil, backward curved, straight radial, paddle type, open impellers and backward inclined. The centrifugal fans work according to the temperature, medium of air and dust load and the industry where it is being used. Steel, stainless steel, PP-FRP lined, MS FRP lined, MS-rubber lined are used in the making of centrifugal fans. Our centrifugal fans range is available with different drive arrangements that depend on the size and temperature. Before delivering the final product in the market we test it as per IS 4894, BS 848 part I and AMCA 210 and rotors are statistically and perfectly balanced to quality grade G 6.3 in accordance to ISO 1940. With the help of our experienced engineers, we are able to design and develop Ventilation Fans. The offered range is manufactured using premium grade raw material, which is sourced from trusted vendors. These products are checked using advanced technology and sophisticated machinery so as to ensure their adherence with the industry norms and standards. Features of these products are given below. 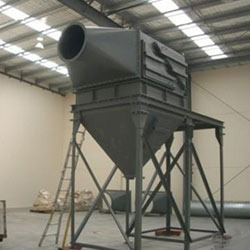 Dust air firstly enters into cyclone separator from dust source through suspended hood which is connected with dust remover. High density dust is radically split by cyclone within the tank large grain size dust is separated and falls into storage tank at the lower end fine particle dust enters the hop-pocket dust collector or filter dust remover remaining fine particle dust is blocked on the surface of the hop-pocket and cylinder clean air is discharged out of the dust remover after passing through the filter material. 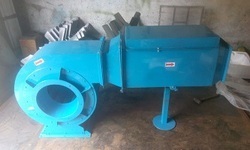 The former part of the cyclone separator has separated most of the dust particles (efficiency>75%), so dust removing burden in the later part is reduced, which enhances filtering efficiency and prolong its service life. We are a quality centric organization entertaining our clients by manufacturing and supplying a broad assortment of Packed Bed Scrubber. 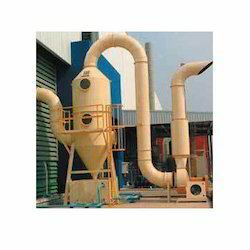 Find application in different industries including chemical, power plant, food processing, beverages and cement, these scrubbers remove soluble chemicals, fumes, and odors from the working premises. Contaminated gas flows through a specially designed packing media that is wetted with re-circulated liquid. 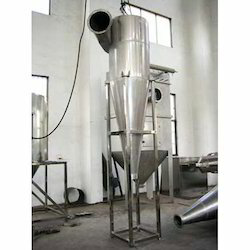 In order to manufacture high quality Packed Bed Scrubber, we employ optimum grade materials and modern technology. Unmatched performance, low maintenance and user friendly operation are some of the attributes of our scrubber. Construction with a fully welded centre cyclone. 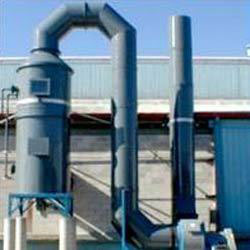 Our custom design Industrial Scrubber is generally installed on chimneys or air exhaust systems to control pollution. These are made of high graded raw material with the help of sophisticated machines and latest technology. The exhaust gases of combustion may contain substances considered harmful to the environment and the scrubber may remove or neutralize those substances. 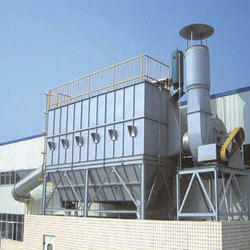 A wet scrubber is used to clean air, flue gas or other gases of various pollutants and dust particles. Wet scrubbing works via the contact of target compounds or particulate matter with the scrubbing solution. Solutions may simply be water (for dust) or solutions of reagents that specifically target certain compounds. Process exhaust gas can also contain water soluble toxic and/or corrosive gases like hydrogen chloride HCl or ammonia NH3. These can be removed very well by a wet scrubber. We are providing our clients an excellent quality gamut of Polypropylene Blowers. The offered products are manufactured using high quality components under the guidance of skilled professionals. This range is extensively used to handle harsh fumes, vapors & gases, and finds application in diverse industries like chemical, oil, petrol, etc. This product is available with us as per the varied specific requirements of the clients, and is appreciated for its robust construction, reliable performance and longer service life. We offer these PP Blowers at reasonable prices. 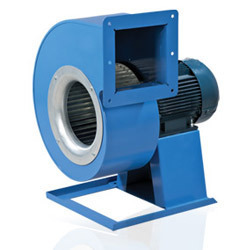 We have emerged as one of the prominent manufacturers and traders of a wide assortment of Turbo Blowers. These blowers are designed with several blades mounted all around in order to ensure the smooth operations. This range of blowers is widely appreciated for the sturdy construction and durability features. Moreover, for attaining out customers’ trust and satisfaction, we make sure to dispatch the entire assortment in a stipulated time frame. We are offering costumed designed Axial flow fans that are assembled with varied parts like motors, impellers, bearings and flanges. They are widely used in varied industries and are manufactured in compliance with the requirements of the clients. Their driving and V-belt arrangements are specifically done to deliver best performance to the clients. Axial flow fans have hot air gas application and are offered at competitive prices. We provide our clients an effective range of Centrifugal Air Blowers that are known for their exceptional quality and performance. 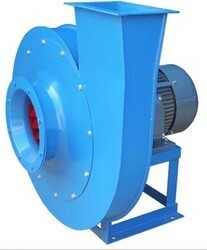 These blowers are available in diverse shapes and sizes to meet different customer requirements as per the requirement. We also custom tailor them if required and provide the at most competitive prices. 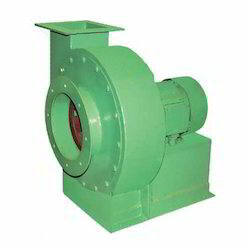 We provide high quality industrial Centrifugal Air Blowers for various applications such as dust collection, material conveying, fume extraction, drying, ventilation purpose, cooling etc. 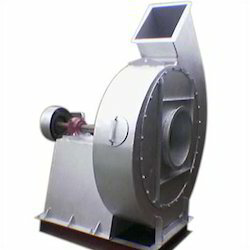 We have carved a niche as the booming centrifugal blowers manufacturer in India. Our wide array of low pressure centrifugal blower is available with backward curve, forward curve and radial fan blower. High efficiency fans that are used in our low pressure centrifugal blower assure low power consumption. As per the demand of the client, various ranges of pressure and volume ratio are available.